BayCard player lets you run stacks created by users of BayCard. The standard version of BayCard is an easy-to-use database program that was designed to allow non-programmers to bring their own visions to life without the need to learn how to write code. Influenced by HyperCard, a BayCard document can be thought of as a stack of index cards. As a result, BayCard documents are referred to as stacks. Each stack contains a background that appears below all cards. 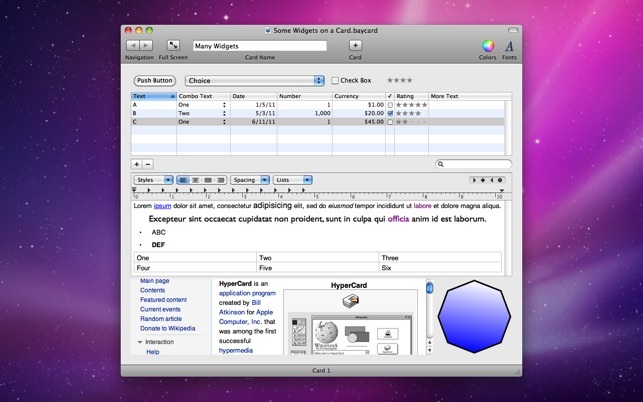 HyperCard is a trademark of Apple Inc. Eliminates some minor cosmetic issues. © 2010-2016 Bayhoff Software. All rights reserved worldwide.